Awesome mail from Downunder! | Wha’ever! Is there a better day than when you get home from work and there is a large letter waiting for you on your doorstep. Containing what? Awesome stuff from Downunder! End of March The Axis of Awesome honoured little Norrköping in Sweden with their visit, giving us an unforgettable night out at Skandia Theatre. They ran out of merchandise but promised free shipment to Sweden during one week after the performance. Can one miss such an opportunity? No. 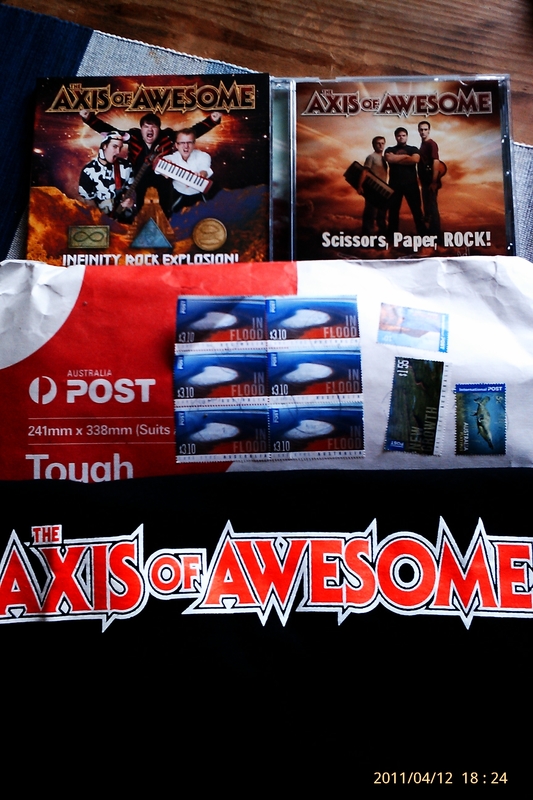 Now I have new stuff to listen to and a new ‘awesome’ t-shirt. Thanks Jordan, Lee and Benny! And Good Luck for your US tour, guys! My personal favourite was the Super Mario performance of Lee and Jordan right at the end, though. And I still suspect that Benny has German roots… when thinking back to his almost accentless German lovesong performance… No wonder he’s so cute ;). This entry was posted in Current Affairs, Life and tagged The Axis of Awesome by anmara. Bookmark the permalink.